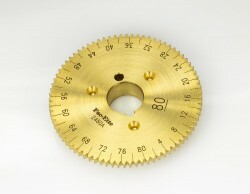 Precision engineered and corrosion resistant brass index gears to suit almost every need. Each color coded gear is laser engraved with lines and numbers. Index gears can be changed easily. Due to the amount of orders currently being processed, please allow for a 4 week delivery period. If ordering from outside of the United States, this delivery period could be longer. The secret of the GemMaster accuracy is it's high quality components, electronic circuitry and craftsmanship, but also in unparalleled "standard" features. Copyright © 2019. Fac-ette GemMaster.